The customers base at Curtain-Tracks.com ranges widely from Interior Designers, Architects, Work Rooms, and General Contractors on the commercial side to Home Owners, Renters, and DIY lovers on the consumer side, and we are here to serve this wide range. Another significant segment of our customer base uses the smaller curtain track systems in their Travel Trailers, RVs, Campers, and Boats. We offer a wide range of smaller sized tracks that are ideal for these type applications, including tracks 3290, 3292, 3294, 3296 and bendable track 4108 to name a few. 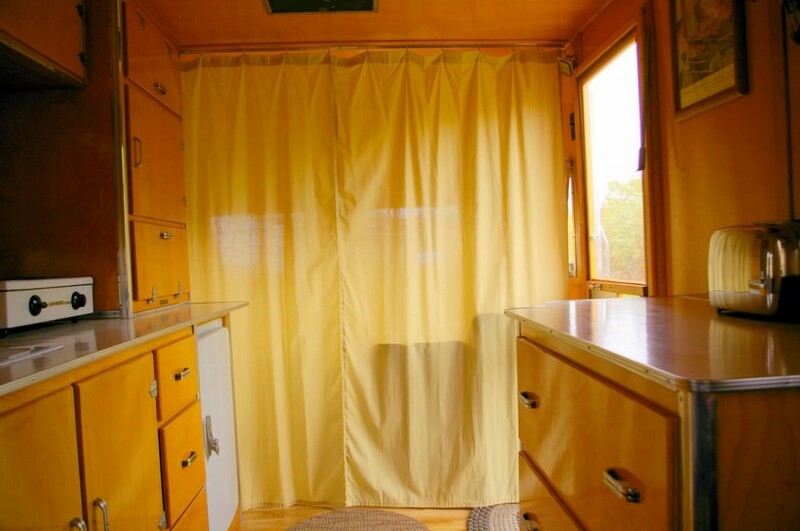 Almost all vintage trailers and campers used curtains on the windows instead of mini-blinds found in many current models. Curtain in campers and trailers offer a softer feel to the interior, and many owners of recent model RVs add additional curtain to enhance the look of their RV. These smaller tracks allow the curtains to be either ceiling or wall mounted, depending on the combination of the track, mounting hardware and carriers. By varying the combination of the curtain track hardware, users can achieve just about any look they may desire. The curtains can range from flat panels hung using snap tape or wrinkle band to pleated curtains or curtain with grommets that both are hung with hooks. Regardless of the look desired, we can typically help the customer tackle these design projects. We can across a great example of a divider curtain recently in a vintage trailer. This particular "house trailer" is a Mobile Sportsman and was restored by Dan in central Illinois. He did a great job bring this antique back to its former glory (actually better than original). In thinking through the refurbishment of vintage trailers and recreational vehicles, space utilization is critical. These RVs are typically much smaller than the modern trailers offered today. While their size adds to the charm of these antique trailers, it highlights the need for effective space planning. Divider curtains can offer a means to provide privacy and divide small areas while avoiding the needs to swinging or stacking doors that may be impeded in small spaces. Divider curtains are also inexpensive and can be easily removed when not needed. If you are tackling a project like this, or one nothing like this, we can probably help. Feel free to call and ask for advise on hardware selection to be sure you achieve the look you want. We like being able to share profiles of projects that demonstrate the wide range of ways curtain track can be used. 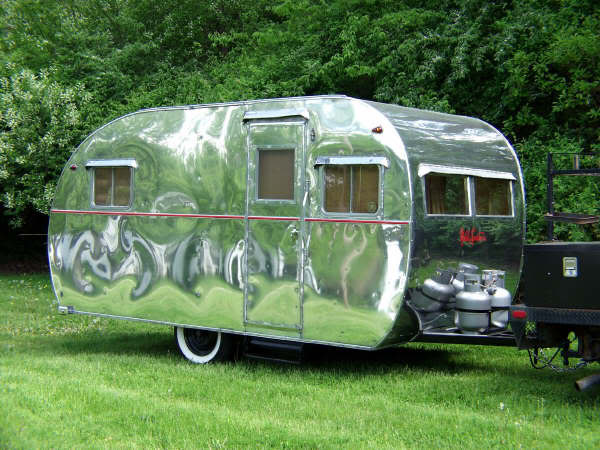 Vintage trailers and campers are a just one of many applications. Have you used them in a creative way? If so, please let us know as we would love to share your project as well.